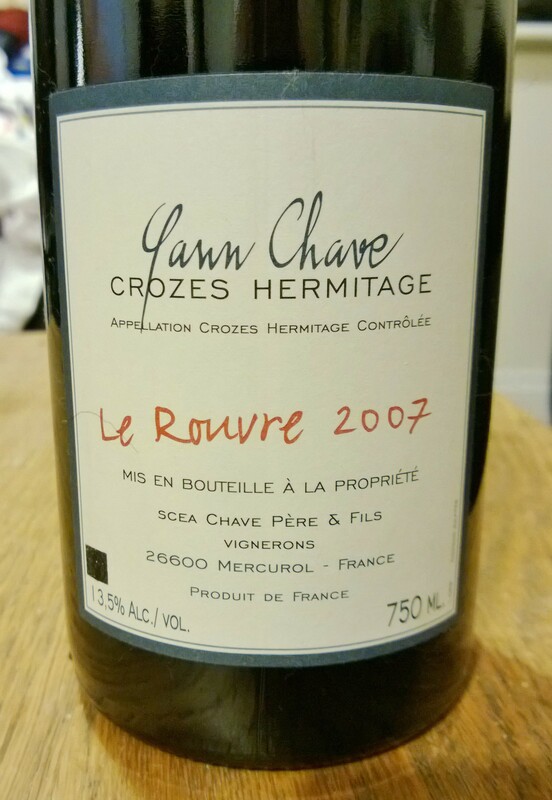 The last bottle of Rhone wine I had was totally repulsive. Since this bottle was handily lying next to the bed I thought I would take advantage of the convenience factor and see if that also was a portent of good fortune. It was! This wine is far better than the crap Courbis Cornas and, handily for those of us with 44p in our bank accounts, it costs half as much! There is a very slight hint of booze-juice to this nose but, to be honest, before I opened this I was so convinced there would be it’s probably just a figment of my remarkably florid imagination. Don’t worry about it. What is definitely there is seductive, complex fruit, with the merest tinge of Crozes greenness and a rich, intricate earthiness. I say ‘rich’ but don’t get me wrong; this is not one of those arse-bitingly-awful sweet and soupy monsters of over-ripeness. No, there is a good balance between ripe fruit and restraint. It certainly smells ready for plucking and that impression is confirmed by the palate. It has plenty of energy, with a rather lovely spicy, peppery complexity, but these exist with placid calm and reserve. It’s not too young, in a closed, awkward patch nor is it too old. Stone, Vine and Sun put this in their New Year sale and by my claggy rude-bits they were flogging it off just when you wanted to be relishing it. The finish has good pepper and earth complexity and those flavours last rather a long time too. This wine won’t blow your prophylactics off with amazing complexity or brilliance, but it has more than enough style to keep you interested through a bottle, and I’d wager a magnum too. Well done Yann Chave for top Crozes effort!